I've been having a lot of "getting older" moments lately, and I haven't decided whether or not I like it just yet. After I wrote last week's post, I felt a huge sense of relief because I was able to write and share exactly how I was feeling at this period of my life. I also felt a huge sense of now what? And with this uneasy feeling, I decided to take this past weekend to get back to doing things that I really enjoy doing. Chad and I found a really awesome new/old restaurant, went on a movie date, and talked about our wildest dreams. I didn't pick up my phone to check Instagram, take photos of my food for Instagram, or watch someone else's date on Instagram. I lived in my moment. Don't get me wrong, I absolutely love blogging, creating and writing to all of you - it's why I started this whole thing in the first place. I love sharing my experiences, thoughts, moments, and healthy recipes with you. But I have to be honest - I'm still trying to figure out who I am and what my purpose is in this world, and that job becomes a whole lot more difficult when you are constantly connected with these images of what your life is supposed to, or could, look like. I took this weekend to just do what I wanted to do; play with some new recipes, get inspired, and live my life. I didn't pressure myself into posting anything or making anything that I didn't truly want to do, and believe it or not, something magical happened. I started envisioning my future, where I wanted to be in five years, and exactly how I was going to do it. I felt excited again, hopeful again, and ambitious again; I felt an old flame that has been dull for far too long. I have that butterfly feeling with a side of wanting to vomit every time I think about it feeling - so that has to be a good sign, right? This moment of recognition and purpose would not have happened if I didn't disconnect with the online world. I tend to get so wrapped up in other people's lives, stories, experiences, and preferences that I forget about my own life, stories, experiences and preferences. There's a fine line between following someone who is a mentor/helping you reach some sort of goal, and following someone who highlights your perception of a "perfect life." For any of my long-time followers, you might recall that I didn't even have an Instagram when I first started this blog because of this exact reason. At the time it was more so about fitness, but surprisingly the food world isn't much different. Instead of comparing perfect shaped peaches, we compare perfectly shaped peaches. Long story always longer, this weekend was a big step in the right direction and I am really very excited about some things we have planned. I won't give too much away but I will say, it involves our community - our real life, in person, Youngstown community. And now the moment you've all been waiting and scrolling for - moist, sticky, sweet, and delicious banana bread muffins! I didn't think I was going to end up posting this recipe because I kind of just threw it together since we had plenty of ripe bananas, but I figured thats all the more reason to post this recipe. It was Sunday morning and I was craving classic banana nut bread so badly that I stopped everything I was doing, mashed up our bananas and gave it a go. As always, I avoided refined sugar (white or brown) and stuck with a single tablespoon of honey, which was totally unnecessary if you would rather just use the sweetness from the bananas. I've been loving sunflower seeds lately, perhaps just wishing they would deliver some sunshine, and I knew they would add the perfect amount of crunch without being overly drying. 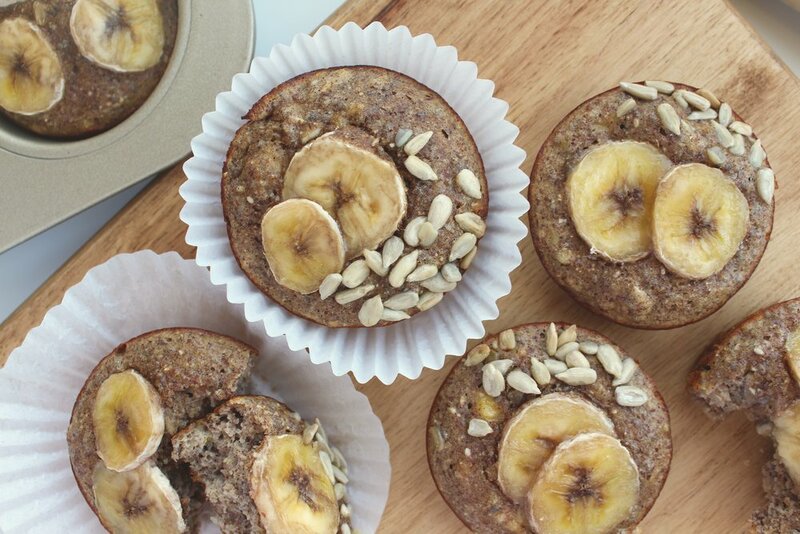 After whipping up the batter and baking for twelve short minutes, our sunflower seed banana muffins came to life and were absolutely delicious! I have about six left in the fridge and they are perfectly sticky, crumbly, and moist. Muffins can often times be tricky and turn out on the dryer side, but believe me when I tell you, these are perfect. Whether you are a muffin lover like myself or want to make the whole loaf, I hope you love this recipe as much as we do! Be sure to tag me @thehealthiest_me or use the hashtag #thehealthiestme so I can see all of your recipes! Preheat the oven to 350ºF and generously grease a muffin tin. Using a large mixing bowl, combine the mashed bananas, eggs, and honey until it has a smooth consistency. Add in the flour, protein powder (optional), flax meal, sunflower seeds, chia seeds, spices, baking soda and sea salt. Continue stirring until a smooth batter has formed. Scoop the batter into the muffin pan, add any additional toppings and bake for 12-15 minutes. For a softer and more moist muffin, remove from heat around twelve minutes and let cool. The muffins should pop right out of the muffin tine and will last for up to one week in an air tight container. I like to keep mine in the fridge to maintain freshness and moisture. P.S. He ate two muffins before we could even take a good picture and despite his expression, he loved them!